This Carnival Monday and Tuesday, make sure you shine on the road with some helpful Carnival tips from Wonderful World! Doing your own makeup for Carnival? 1. Having problems picking up your face gems? Use the Amazing Shine Gem pick up toolor the Milani wax brow pencil. The wax will pick up the gems with ease, which makes for easy gem placement. 2. Problems sticking gems? We have spirit gum! They do not budge even through all the revelry. They can be found at the cashier or just ask our CSRs and they will be happy to assist. 3. Use a primer! Use our range of face primers from Nicka K, La Girl and City Color, to perfect your base for flawless results and fantastic staying power that will last ALL day! 4. When using bright colors on the eyes, use a white primer to intensify pigments. 5. Always set with a setting spray! After you have made-up that gorgeous face, lightly spritz the City Color or La Girl matte setting spray all over the face, to increase longevity of your makeup.These setting sprays will also prevent transferring of your makeup during the day. 6. Keep your lips hydrated! As much as matte lipsticks are tempting, keep in mind you will be palancing in the sun all day. Use a hydrating or creme lipstick, such as our Milani Color Statement Lipsticks to keep those lips plump! Now that you are in the know, SHINE! 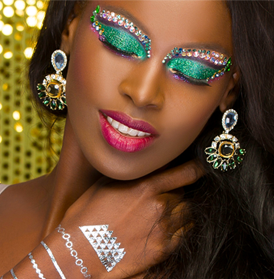 Look your best and enjoy yourself this Carnival season.